‘Euthanasia Exposed’ is a network of South Africans exposing the deceptions and misleading arguments of the euthanasia and assisted suicide movement. 1. Euthanasia & Assisted Suicide: We oppose euthanasia (active or passive) and assisted suicide, but not the withdrawal of extra-ordinary medical care (such as life support machines) from terminally ill people or the euthanasia of animals. (See glossary of medical terms). This is also the position of all of South Africa’s medical authorities, our law and the law of almost all countries in the world, and almost all civil society organisations in South Africa. 2. Judicial activism: We oppose judicial activism – the attempt to misuse the judiciary to make radical changes in law not in the wording of the Bill of Rights or intended by the Constitutional Assembly, without following constitutional due process i.e. through elected representatives in the legislature. The South African Bill of Rights and the proceedings of the Constitutional Assembly contain no hint of an intention to legalise euthanasia, and any attempt to do so through the courts is manipulation and unlawful judicial attempt to usurp power. Any change of the existing law on euthanasia would Constitutionally have to go through the elected legislature, where it was dismissed in 2004 and is unlikely to have any success. History: The euthanasia lobby have been trying to get euthanasia legalised since the early 1990s. First they asked the South African Law Reform Commission to investigate the possibility. Their 1999 consultation found the idea overwhelmingly rejected by almost every civil society organisation. No political party supported the cause and the Parliamentary Committee on Health confirmed the idea rejected in 2004. In 2014, a new group was formed, who realising they would not get support in parliament decided to try the courts. 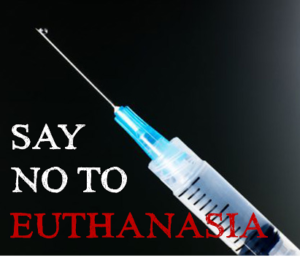 In April 2015, in an urgent one day trial, in a reckless abuse of authority, judge Fabricius authorised a euthanasia. The applicant, Stransham-Ford thankfully died peacefully the day of the trial. The State and the Health Professions Council are appealing the case to prevent it creating a precedent. We believe the euthanasia lobby will be defeated again.